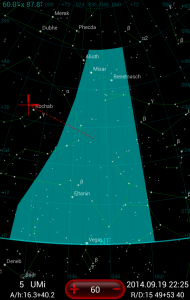 DSO Planner is the only digital star chart on the mobile apps market (as of July 2018) providing reliable star charts down to 16th magnitude. Which will guarantee that any star you can see in the eyepiece of a telescope up to ~20" is identifiable on the chart. 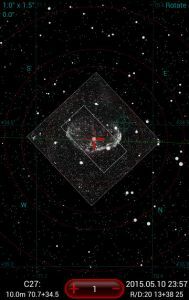 DSO Planner has the best in the industry support for the Pattern Matching target pointing technique with Telrad, which is faster and more reliable than any other telescope pointing method in existence, including GoTo motorized mounts. The Night Mode of DSO Planner user interface designed with the help of the superstar neurophysiology scientist to minimize the effect of the screen on observer's dark adaptation. The user interface of DSO Planner is unique in its single-handed / single-touch design, which means your other hand could be always available for telescope tasks or you can work with it in warm mittens/gloves using any capacitive stylus when necessary. The new Version 3.6.0 just released! The free fully functional General Catalog of Variable Stars (GCVS) database file, adding all of its 47'987 variable stars to your databases pool and to the Star Chart on demand is readily available on the brand new discussion board of our users' forum "Objects Databases Exchange"! The powerful importing feature of DSO Planner is explained there as well (with the additional Knowledge Base reference), along with the proposed format of the users databases exchange posts example and explanation. Please contribute your lists on that board (registered members only). 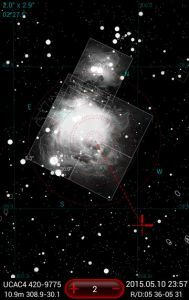 DSO Planner is the astronomy observations' planning tool with excellent star charting capabilities for the field use. 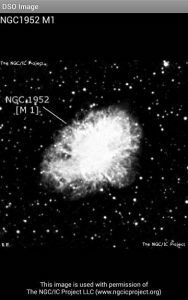 It is made by experienced amateur astronomers with a passion for visual observations. It provides access to a huge pile of deep sky objects databases and provides powerful tools to extend it in any direction. DSO Planner boasts the largest star catalog among all handheld astronomy applications in the world (USNO UCAC4, 113 million of stars! down to mag.16), making any paper star chart obsolete. 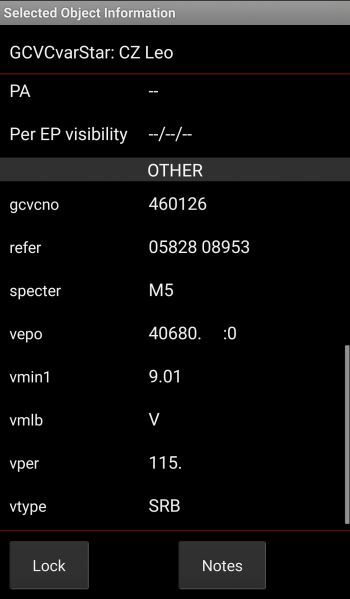 It excels at creating observation plans on the fly, has integrated observations note-taking capabilities (including the voice recorder), powerful objects' databases features, allows observing information sharing, works with settings circles' PushTo and computerized GoTo telescopes, and provides the best in class night mode single-handed user interface for Android devices. Before installation please make sure that you have at least 2 GB of free space on your internal SD card to download application databases! 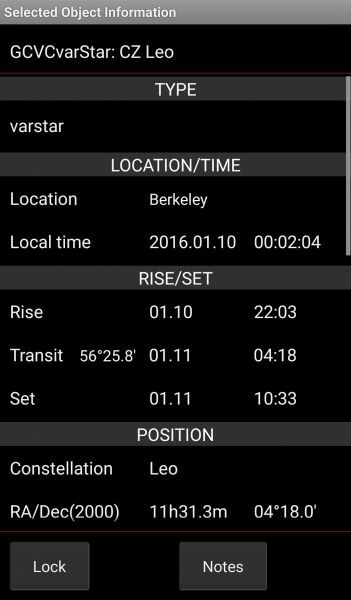 Star catalogs: USNO UCAC4 (full star coverage up to 16m, 113 millions of stars - the largest star catalog ever available on Android platform, exclusively in the DSO Planner PRO), Tycho-2 (2.5 mn stars), Yale bright star catalog (9 000 stars). Deep sky objects catalogs: NGC/IC (12 000 objects including Messier, Caldwell and Herschel 400 objects), SAC (Saguaro Astronomy Club database, 10 000 objects), UGC (13 000 objects), Lynds Dark and Bright Nebula (3 000 objects), Barnard Dark Nebula (350 objects), SH2 (300 objects), PK (1 500 planetary nebula), Abell Clusters of Galaxies (2 700 objects), Hickson Compact Group (100 objects), PGC (1 600 000 galaxies). Double Star catalog: Brightest Double Stars (2 300 stars), Washington Double Star Catalog (120 000 stars), double stars from Yale catalog. Details panel with PA and separation for each component. Bright Comets: Orbital elements of around 700 observable comets; can be automatically updated over the Internet. 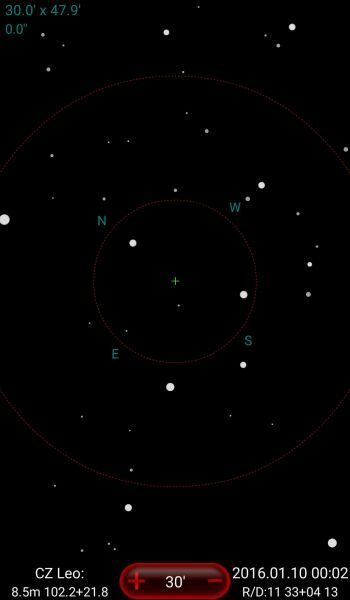 Minor planets: Database of 10 000 brightest minor planets. Famous Steve Gottlieb Notes automatically attached to the NGC/IC objects details data. 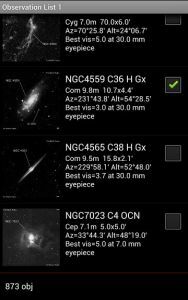 Custom user made catalogs: you can create or import fully searchable personal catalogs of any celestial objects you like to have charted. Object names cross-matching database: Search for objects by their less common names. 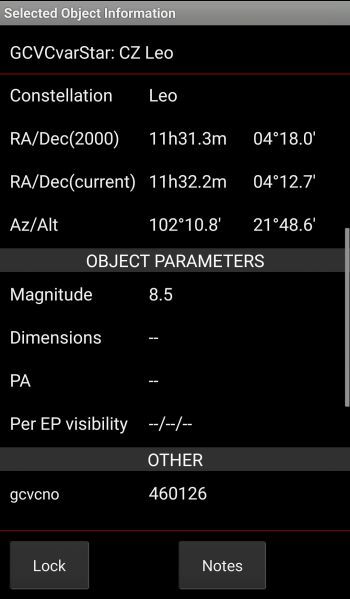 DSS (Digital Sky Survey) imagery support: Download DSS images of any sky region into the offline cache and show the image on the star chart as an aligned overlay. Offline objects images: Integrated set of images for most of the objects from NGC/IC catalog, add your own images to custom user database records. Nebula contours. Contours of famous nebulae. 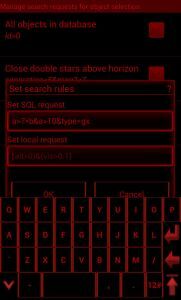 The best in the industry Night Mode: Shades of deep red color scheme with custom red keyboard, menus, and floating Android navigation buttons - suitable for working in the "black" light pollution zones. 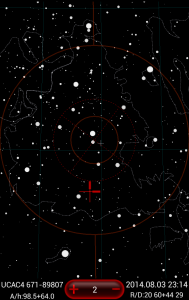 Advanced and practical star hopping aids: Customizable oriented Telrad overlay, Eyepieces FOV overlay with RA/DEC guides and compass, directional guide, oriented object marker, target locking and centering, manual control of stars' boldness gradient individually per FOV level, fast mirroring and rotation of the chart. GoTo serial protocols support for Meade and Celestron controllers using an arbitrary Bluetooth dongle. 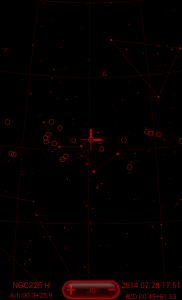 Eyepieces and CCD FOV overlay support (the finderscope FOV can be simulated as well). 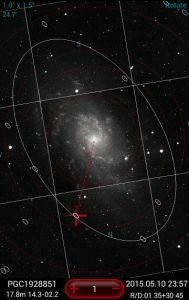 Night Planning tool: Use your particular geo-location, sky conditions, astronomical equipment, expected time range of observation, as well as the target objects features (type, dimensions, magnitude, minimal altitude, visibility, and any other custom data fields of your own catalogs) to filter objects available to observe on the night in the matter of minutes. Remove duplicate objects when searching in intersecting databases. Sort the observation list by the set time or primary parameters of the objects. Create up to 4 switchable observation lists to use simultaneously. Track and document your observations progress. Unique true visibility calculation algorithm, filtering the objects list out of any objects, which visibility quality is below the user defined threshold value, based on the selected observing equipment and the current sky conditions. Data Import tool: Import observation lists in the DSO Planner native, Sky Safari, and Sky Tools format. 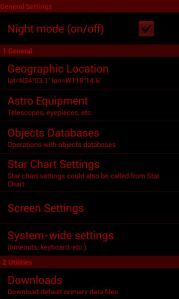 Use pre-compiled Night Sky Observer's Guide observation lists. Individual observations notes taking: Take and maintain textual and/or audio notes for observed objects within the app. Flexible observing location setup: user database, GPS fix, manual coordinates input, list of 24 000 cities worldwide to select from. 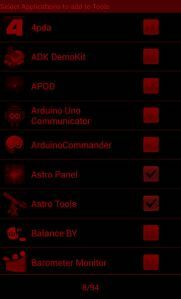 Equipment database: Keep track of all your telescopes and eyepieces (including the CCDs). 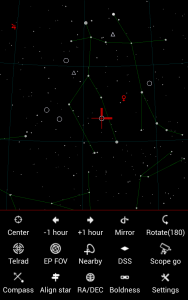 DSO Planner can use them for the true object visibility calculation and for the Star Chart marking. The 500 popular eyepieces database is provided for easy input of your eyepieces optical parameters. Standalone Twilight Calculator: Easy to read worksheet displaying periods of the maximal darkness on a given night, as well as for 30 days ahead. Two visual themes of the user interface (bright and dark). Dual screen mode with the Side Chart complementing objects lists (great for tablets, but works on phones as well). Powerful share/export/import capabilities for all of the DSO Planner databases, observation lists, and observation notes. Enormous possibilities for the look and feel customization of the app through the highly organized options menus. User settings and custom data backup capabilities. This page was last modified on 21 July 2018, at 05:31.